Strategic Air Command DVD (Region 1) Color. Widescreen. James Stewart, June Allyson, Frank Lovejoy, Jay C. Flippen, Harry Morgan. Exhilarating demonstrations of classic military tactical procedures and excellent footage of vintage aircraft (like the rare B-36), combine here to give viewers a cold war primer on the Air Force's defense capabilities, circa 1955. Former World War II pilot James Stewart is called out of retirement to assist in the strengthening of the Strategic Air Command, the new bomber forces that are America's first line of defense against the Russian nuclear threat. Wife June Allyson sits at home and frets over her husband's devotion to duty, while Harry Morgan lends a hand on the aircraft. 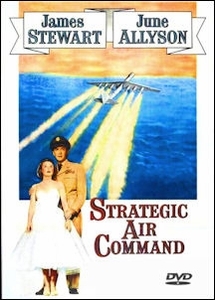 Through Stewart, director Anthony Mann takes us on an ersatz tour of the elite Air Force operations that safeguarded America at the time.